Better than ever, the Summer Fair is back again the last weekend of May – 27, 28 and 29. The midway, pony rides, concession, Beer Garden and live music are all going on and this year there is also a parade! Notices were sent out to the Chamber membership to enter a float and take advantage of the opportunity for Fair week specials while we have a number of visitors in town. It’s going to be a busy and exciting weekend! And the long range weather forecast looks promising! The Town Wide Yard Sale is back too. There is no charge for registration and a list of participants will be published with address info and a map. There was a lot of interest in this last year and we had some good feedback – so if you’ve been planning a yard sale – this is the perfect time. The Manitoba Youth Job Coordinator is on the job upstairs in the courthouse. Michael Macaraeg can be contacted at 204-841-1294 or by email at neepawamyjc@gov.mb.ca Michael is there 8:30 to 4:30 and will be registering summer student employees and odd job seekers during the next couple of weeks. If you are an employer needing some summer help, give him a call. He will be happy to help. 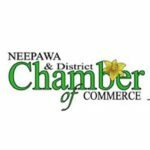 After the Fair, the Neepawa & District Chamber of Commerce office will be on limited and irregular hours for the summer. More details will follow. In the meantime, Enjoy the Fair, and have a wonderful and prosperous summer!